Well, I think I just passed some kind of milestone. I did my first woodworking demo tonight. 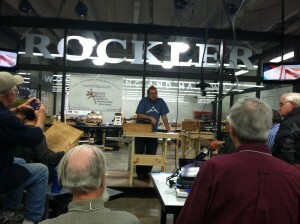 The Northwest Woodworkers Association asked me to do a demo of my carving at their monthly meeting held at Rockler. I think it went all right, they seemed to like it and I got some good compliments from the guys afterwards. It was my very first demo, and I’m not what you’d call good at public speaking. I was super nervous, but it went all right. I’m teaching a class on Flat Relief Carving in April at this store, if any one is interested and I think there are at least a couple spots still open. It’s a two day class, $100 for the whole thing and they are going to have tools available I think. This was a good warm up for the class that’s for sure.